My favorite activity is soldering, and using torches, so I tend to design my work to be quite solder intensive, so I can spend as much time soldering. I have a large range of assorted torches, plus a number of "retired" torches. Recently, my trusty 15 year old Little Torch wasn't working properly, so I took it out and put in a second Little Torch in it's place. Sure enough, it wouldn't turn off when I was done soldering, so both torches needed repair. On my old welding torch, one of the tips wasn't lighting correctly, and despite cleaning, wasn't performing. I took both Little Torches and all of the welding torch tips to the local Airgas office where I get my acetylene/oxygen supplies. The Little Torches were taken in to be fixed and then the office guy tried to look up in the catalog for more of the welding torch tips. His partner went off to call the welding manufacturer to get the correct code of the torch tips. She came back and said, my welding torch was an antique. It was over 50 years old and they no longer make the parts for the torch. We were all laughing in disbelief as just how old my torch was. Why, the torch was practically new when it was given to me by my father, along with another welding torch. So when I got home, I found the original manual to the torch plus ads for welding supplies. Here's a picture of the "antique" welding torch that is laying on the paper with the tips in the middle. The torch on the bottom is by Purox, again an oldie, plus a fabulous curvy old tank wrench I use, and on top is my grandfather's cutting torch. I had that one serviced and the guys at Airgas were drooling over it since it was a big, nice one, from the 80's. 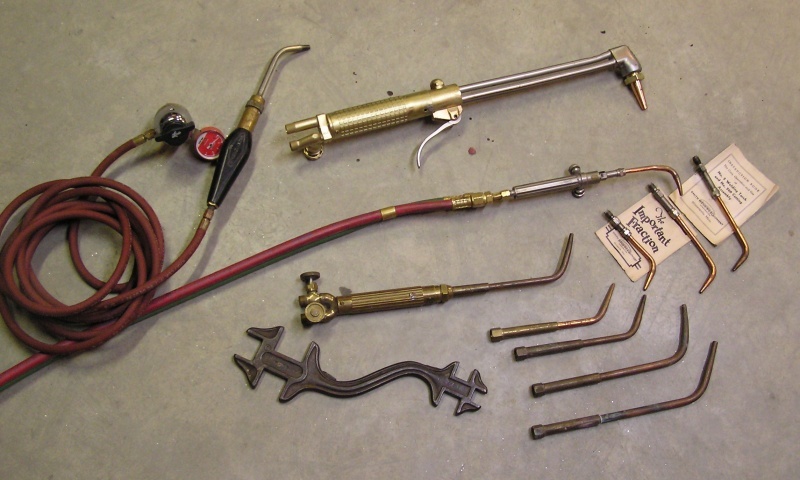 The torch on the left with the coiled hose is an UniWeld acetylene torch, my very first one that I bought and used for many years. It's now my backup torch and when I travel, it often comes with me. The second picture is my gallery of "retired" torches, odd torches I've picked up here and there, some from my undergrad college where they were throwing them out. 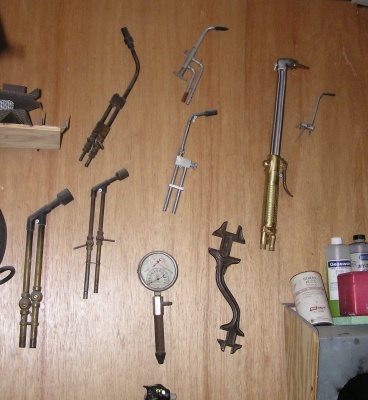 I just like hanging old tools on the wall. In fact, an antique dealer pulled out this thing when I was browsing thru her store and I recognized it as an old torch so I told her that. She just gave it to me plus a few odd things. Torches have a way of finding me since so many of my torches were given to me. I think I only bought 5 or 6 and the rest which is probably a dozen given to me. My motto is, you can never have enough torches. The more, the better! As long as the working ones are kept maintained.